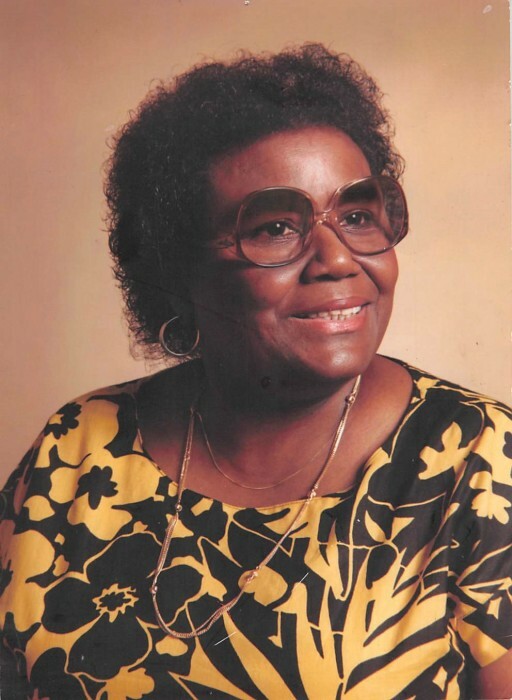 Bessie Mae Clayton was born August 7, 1926 in Dora, Alabama to the late Eugene and Maggie Watkins. She was the youngest of ten children born to this union. Her siblings were: Willie, Frank, Jesse, Ellacy, Zellacy, Lorena, James, JB and Emma. Bessie’s parents and all of her siblings preceded her in death. Bessie received her early childhood education in Dora, Alabama. She graduated from Praco High School in Praco, Alabama in May 1945. Upon graduating, she was united in Holy matrimony to the late Willie Marris Simpson who was serving in the United States Army. To this union one child, Patricia Ann Simpson was born. Bessie later married the late Robert Steven Clayton. To this union one child, Michael Clayton was born. They were married until his death in 1982. By the time Bessie was four years old, her parents had died. Her sister, Ellacy, stepped up to the responsibility of raising her and her sister, Emma. Times were hard for these three. There were times when they only had beans to eat. No meat, no vegetables, just beans. On occasion they had pie. So, the menu for the day was beans and pie. But, they never went to bed hungry because the man in their lives was God. God will always provide. When Emma saw that her little sister did not like her first name Bessie, Emma began calling her by her middle name Mae. Bessie lived in a number of places before settling in Cleveland, Ohio. She lived in Dora, AL; Flattop, AL; Alden, AL; Bessie, AL and Pittsburgh, PA before joining her husband Robert Clayton in Cleveland, Ohio on Amor Avenue. Bessie’s first employment was in the laundry room at the Statler Hotel in Downtown Cleveland. She loved to tell the story of laundering the shirts of Sammy Davis Jr. She was shocked that his shirts were so small. They were child-like. She and her husband saved their money and bought a house on Lotus Dr. where she lived from July 3, 1964 until her failing health in July 2006. Bessie loved playing cards. The kids taught her how to play spades but she didn’t think highly of spades because she said that spades did not require much thinking. Bidwiz was her game of choice. Bessie enjoyed crossword puzzles, Jeopardy, Wheel of Fortune and The Price is Right. She especially loved to cook for her family. Making a caramel cake for every birthday was a must. Bessie also enjoyed caring for her dogs Judy and Sam. Once Bessie could no longer care for herself, she resided at the home of her son Michael who made sure that she received the best of care. No nursing home for his mother! Those who will be most profoundly deprived of her warm, gentle personality and strength of her loving character are, One daughter- Patricia Ann Simpson of Warrensville Hts., OH; One son- Michael Clayton of Maple Hts., OH; Three granddaughters- Tomiko Lamai Simpson of Maple Hts., OH, Sagé DeWitt Yarbrough-Rucker of Akron, OH, Lauren Michelle Clayton of Maple Hts., OH; One grandson-Robert Oliver Clayton of Maple Hts., OH; Two great-granddaughters- LaVysia Lamai Richmond of Shaker Hts., OH, and Celine DeWitt Yarbrough of Akron, OH. Bessie has nieces and nephews that always found time out of their busy schedules to visit her on her birthday. Hawthorne (Hoppy) Conley, Erby Conley, Doris Williams and Barabara Jackson all from Pennsylvania. A special thanks to Lillye Black and Joyce Clayton (sister in- laws) and Roderick Weatherly who always dropped in to see how she was doing. Much appreciation to her aides Regina and Jasmine for taking special care of Bessie during her last few years.